I received a Omega VRT350HD Juicer from my Nutritionist, Cal educated, daughter this Christmas. My New Years resolution this year is to increase my antioxidant levels to above 50,000 on the scanner by juicing one meal a day and combining it with my regular sub 2200 calorie diet. Last years resolution, to loose 15 pounds just by limiting caloric intake to 2200 and exercising was successful This year the goal is to increase my nutritional intake and keep it at a high level. The last couple weeks have taught me that it takes a lot of refrigerator space and time to juice at that level. Its has not been expensive to load up on green vegies and fruits however there is a time cost in doing it. I have gone off of my Pharmanex supplement plan just to see If I can maintain my high levels without vitamin supplements. For those with busy life styles, eating properly is a time consuming effort. Some of our patients utilize services that deliver fresh vegetables and fruit directly to there homes. Companies like Farm Fresh to You can help simplify the ability to eat 9 potions of vegetables a day. In addition, juicing takes up time and effort. Although I personally recommend that optimal nutrition should be attained from natural sources instead of supplements its not a practical solution for most. Pharmanex supplements are unique in that they are designed to be absorbed, they are pure and clean (manufactured at pharmaceutical level quality) and are guaranteed to work and be absorbed. 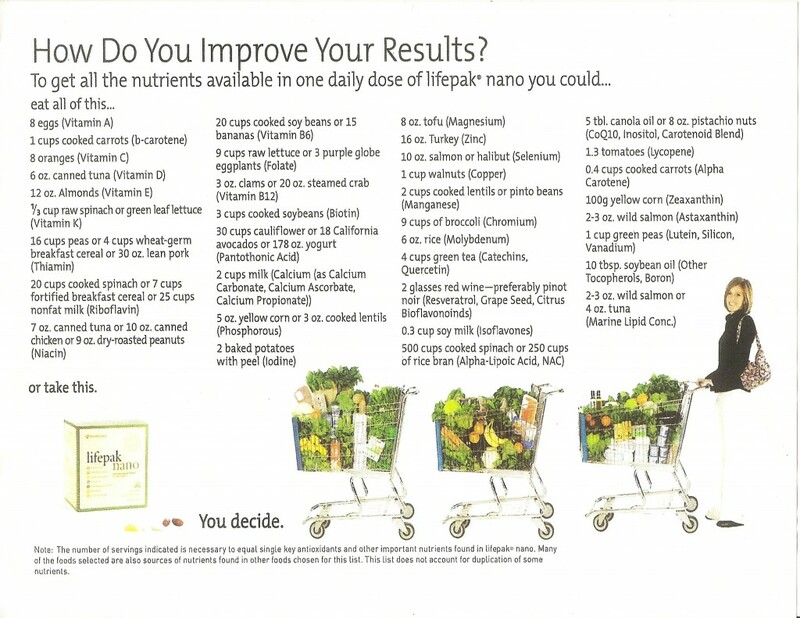 By signing up for a basic supplement program (2 lifepack nanos a day) your scanner scores will improve over a 2 month period or you don’t pay for the program. That’s a money back guarantee that your nutrition will improve in an easy to implement way. If you are truly interested in results and convenience or if you are already taking supplements but have low scores, we urge to to try this program. The program comes to 4 dollars a day and is equivalent to eating 10 portions of fruits and vegetables a day. Consider how much you are spending on supplements that are not working, or nutritious fruits and vegetables . Maybe you are spending more than 4 dollars a day and not benefiting. The Biophonic Scanner gives you a convenient and accurate feedback on your progress and can be a part of your regular checkups at our office.